Evil-eye beads, sometimes called nazar boncuğu, sometimes nazar boncuk, are Murat’s specialty. For more than 25 years he has made and sold thousands of them at his three stores, the largest of which is behind the busy Egyptian Spice Bazaar in Eminonu. Murat’s wares are round beads or flat discs, the nicer ones made of glass, the cheaper ones of plastic. The decoration is minimal yet striking: a blue or turquoise ring circling a lidless eyeball. Spend any amount of time in Istanbul and you will come across this image. One would be forgiven for thinking the eyeball an emblem of the city itself. The beads fill stalls in the Grand Bazaar. They dangle from rear-view mirrors. They mark the entry to hotels. The eye is spray-painted on the sides of countless buildings below the Galata Tower. The prevalence of the beads speaks to a widespread belief in, one might even say obsession with, the evil eye, which in Turkish is called nazar. Zeynel Erogul, a Turkish astrologist who is a frequent guest on talk shows in Turkey, speaks of the evil eye as a ray of light that originates in the brain and is transmitted through the eyes as negative energy. This negative energy is serious business. One of my good friends, Azer, told me that he once had so much of it in him that when he touched the prongs of his wrist bracelet, a bracelet designed to maintain the energy balance in his body, the bracelet split in half. Sometimes the bad energy gets transferred knowingly, in the form, for instance, of a covetous glance; sometimes it pours forth unconsciously. A casual compliment about the health of a child or the beauty of a car could conceal envy and jealously and thus be the very vehicle in which the evil eye travels. Some eyes are better conduits for evil that others. Mavi gözlülerin nazarı daha çok dokunur, goes a common saying in Turkey. It means, “The evil glance of a blue-eyed person is more powerful.” Green eyes, which are rare in Turkey, are also suspicious. As New Agey as it sounds, the evil eye actually has roots in ancient Mesopotamia and many Mediterranean cultures later adopted the belief. In Greece, it is called to mato, in the Arab world nazar battu, in Spain mal de ojo, in Israel ayin hara. It is easy to see why Murat Dikmen chose to set up shop in Istanbul. Everyone here seems to have a story about the evil eye. Mehmet Bey, a banker, told me that his father refuses to hold or hug kids under a year of age for fear that his green eyes will cause them harm. He did not even make an exception for his own grandchild. The owner, doubtlessly a shrewd man, did not question the teenager’s conclusion. But he did question his offer: he wanted the full amount. 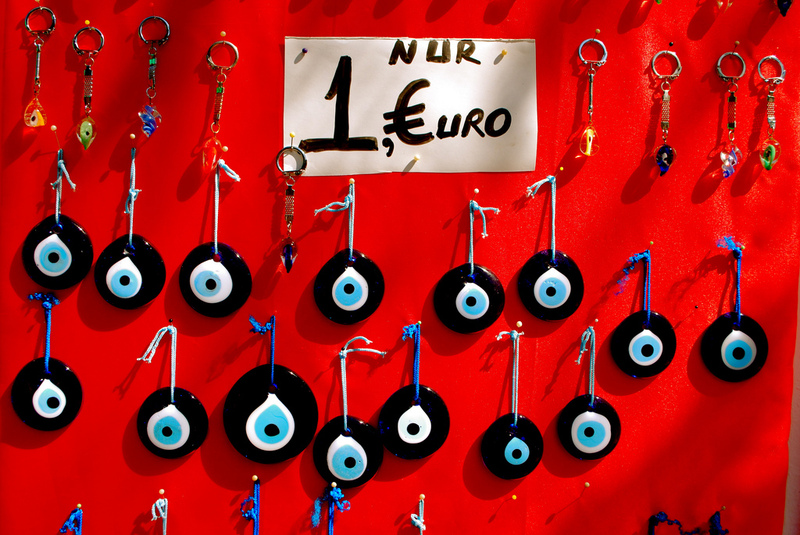 Although many Turks believe in nazar, fewer believe in the protective efficacy of evil-eye beads. Murat, for his part, puts little confidence in the power of the beads he pushes but says he doesn’t judge those who do. At worst, he says, they are harmless talismans. But, like the imam at Dikmen’s mosque, many Muslims consider using the beads an affront. So rather than use beads to ward off the evil eye, devout Muslims often take other protective measures. Some pray specific verses from the Koran. Some incant the word mashallah (“What God has willed”). And yet the beads remain. Sometimes they seem to freeze the city in one chilling, wide-eyed glare. When our son was still a newborn, many Turks encouraged us to attach a bead to his blanket and clothes for protection against the evil eye. My wife and I would tell them that we didn’t believe in the evil eye, to which they would respond with some variation of, “Of course, it isn’t the bead that protects, Allah protects.” Still, they insisted we attach it. Perhaps Murat’s imam provides the best answer for the incongruity. Much to the relief of the bead seller, he followed up his warnings against nazar boncuğu with a disclaimer. Although hanging the beads for protection was off-limits, hanging them for decoration, he said, was a different matter altogether. As ornaments, he said, nazar boncuk were fine. The line between adornment and superstition is blurry. It is a line that Murat is all too happy to toe. Russell C. Hanover lives in Istanbul and blogs at istanbuldanevar.wordpress.com.